Q: US officials said yesterday that two Chinese J-10 fighter jets intercepted a US Navy surveillance plane EP-3 in the "international airspace" over the East China Sea on Sunday, with one jet coming "unsafely" as close as about 90 meters of the American aircraft. The US side also said that encounters like this do nothing but increase the risk of miscalculation. Can you confirm this and comment on it? A: For the specifics and technical details you mentioned in your question, I would refer you to the Defense Ministry for an answer. I want to point out in principle that China is always committed to safeguarding overflight order and security over the sea and establishing military mutual trust with other countries to properly handle disputes. However, US military vessels and planes have long been carrying out frequent surveillance activities close to China's coastal waters which poses a grave threat to China's maritime and airspace security. 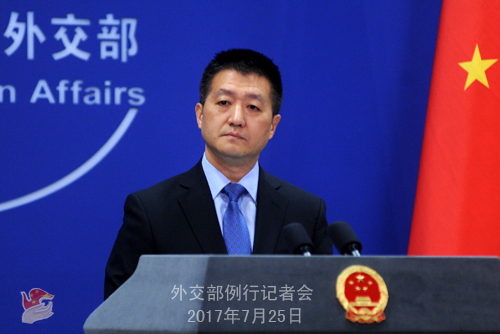 China urges the US to immediately stop all close-in surveillance activities and avoid a recurrence of such incident. Q: Philippine President Duterte delivered his state of the nation speech yesterday, in which he said that the Philippines will follow an independent foreign policy and develop friendly relations with all countries on the basis of equality of sovereignty, mutual respect and non-interference. The Philippines now has cultivated very good relations with China through bilateral talks and other mechanisms which eased tension between the two countries and improved the environment to negotiate the South China Sea issue. What is your response? A: We have noted relevant remarks made by President Duterte. The Philippine government adheres to an independent foreign policy under the leadership of President Duterte and develops normal relations and mutually beneficial cooperation with other countries on the basis of equality and mutual respect. China speaks highly of that. Since assuming office last year, President Duterte has been working to improving relations with China and putting China-Philippines relations back on the right track. The past one year and more have seen all-around cooperation between China and the Philippines making important headways, frequent high-level visits, political mutual trust going deeper, practical cooperation demonstrating greater potential, and maritime dialogue and cooperation starting again. All these have benefited not only people in China and the Philippines, but also relevant countries in the region. Foreign Minister Wang Yi is on a formal visit in the Philippines. We believe that his visit will bring bilateral ties closer. China also stands ready to continue working with the Philippines to consolidate friendly cooperation and improve all aspects of China-Philippines relations. Q: Can you just please reiterate the last part of your response to the US surveillance plane intercepted by the Chinese planes over the East China Sea? A: What I said in the last part is that US military vessels and planes have long been carrying out frequent surveillance activities close to China's coastal waters which threatens China's security and works against building mutual trust between the two militaries. We urge the US to immediately stop such surveillance activities and avoid a recurrence of such incident. Q: In mid-July, the Thai government announced that it had approved the budget for the first phase of the China-Thailand railway to link Bangkok with Kele. Yesterday, Foreign Minister Wang Yi, who was in Thailand for a visit, and his counterpart also raised the topic of the construction of the China-Thailand railway. How do you see the future of the China-Thailand railway project? A: China and Thailand are like brothers. China-Thailand relations have been developing with a sound and steady momentum. The two countries have been carrying out practical cooperation in various fields under the principle of mutual benefit and win-win cooperation and with fruitful outcomes achieved. Railway cooperation is an important part of China-Thailand mutually beneficial cooperation as well as a connectivity project under the Belt and Road framework. It will further connect the Chinese and Thai market and elevate the economic and social development of Thailand. It will also realize a breakthrough of the pan-Asia railway network and promote the development of the whole Indo-China Peninsula and the ASEAN region as well. We would like to work with Thailand to coordinate closely and bring the project to fruition at an early day. I want to stress that China always attaches importance to China-Thailand friendship. We would seek greater synergy between the Belt and Road Initiative and Thailand's national development strategy, make solid steps to promote bilateral and multilateral cooperation, and further elevate China-Thailand Comprehensive Strategic Partnership for Cooperation so as to bring more benefits to the two countries and regional people. Q: According to some reports, at the beginning of a new semester in Australia, flyers saying that "Chinese people are not allowed into the building, otherwise they would be indicted or deported" were found on the campus of prominent universities like the Melbourne University and the Monash University. The security staff of these universities assisted in removing the flyers and handed over the copies of the flyers and CCTV images to the police. What is your comment? A: This incident has raised dissatisfaction and disapproval from Chinese students studying in Australia and drawn attention from the Chinese people back home. I have noted reports saying that relevant universities have removed the flyers and handed over relevant information and material to the police. We hope that this case can be handled properly as soon as possible. The safety, dignity and legitimate rights and interests of the Chinese students in Australia must be protected with concrete efforts. Q: A Spanish oil company has been ordered to stop drilling in the disputed area in the South China Sea according to sources in Vietnam. Can you confirm this information and if the Chinese government has ever pressured the Vietnamese government or the Spanish company to stop these drillings? A: China has indisputable sovereignty over the Nansha Islands and sovereign rights and jurisdiction over relevant waters, the seabed and subsoil thereof. 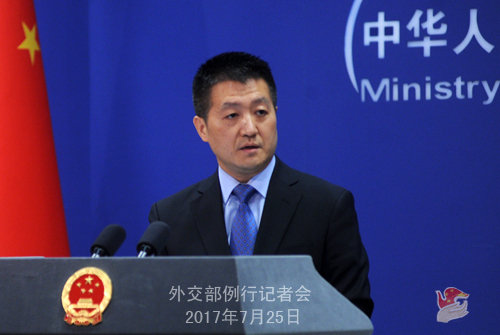 China urges the relevant party to stop its unilateral actions that infringe upon China's rights and safeguard with concrete actions the sound situation in the South China Sea that does not come easily. 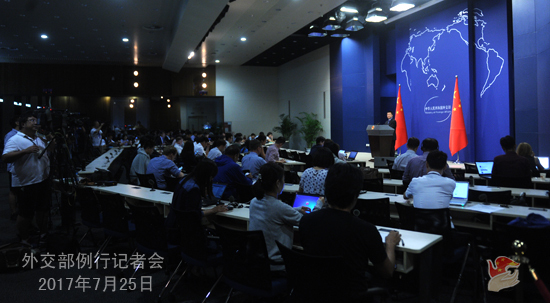 Q: It is reported that Chinese troops are enhancing military defense capability on the China-DPRK border by conducting drills and transferring more soldiers from other places, to prepare for a possible crisis breakout on the Korean Peninsula. Can you confirm it? Is this China preparing for possible military attack by the US on the DPRK? A: The Chinese military maintains its normal combat readiness and routine training at the China-DPRK border. Q: I want to ask if there is any update on the 200 Chinese that have been detained in Egypt? Can you confirm if they are indeed detained and if they are detained at the request of China? Will they remain in Egypt or be sent to other countries or sent back to China? A: My colleagues and I have already answered this question. Recent years have seen increasing exchanges between China and Egypt. The Chinese government always asks Chinese citizens in Egypt to abide by Egypt's laws and regulations. We have noted the announcements made by the relevant department in Egypt saying that some foreigners, Chinese people included, were arrested because Egypt has tightened its management on foreigners residing in the country. We would like to reiterate that Chinese citizens in Egypt must abide by the laws and regulations of Egypt and avoid participating in activities that do not match their residence status.